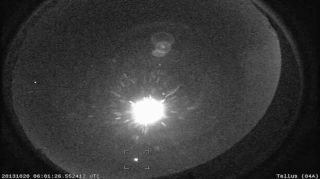 The camera of Tellus Science Museum in Cartersville, GA, part of NASA's All-Sky Fireball network, captured an Orionid Meteor fireball blazing across the sky on Oct. 20, 2013. The Orionid meteor shower produced some amazing cosmic sights for stargazers, including two brilliant fireballs, despite a bright moon and predictions of a less-than-stellar show. NASA's all-sky fireball camera network captured video of the Orionid meteor shower fireballs produced when meteors slammed into Earth's atmosphere on Oct. 20. In total, the all-sky network detected 15 Orionid fireballs last night, according to SpaceWeather.com. The NGA camera in Dahlonega, GA, part of NASA's All-Sky Fireball network, captured an Orionid Meteor fireball blazing across the sky on Oct. 20, 2013. Orionid activity will probably start to taper off, with the last streaks of light expected to appear in early or mid-November. The Orionids occur when Earth passes through debris left behind by the famous Halley's Comet. Bits of dust left in the comet's wake burn up in the atmosphere, creating the potentially brilliant annual light show. About 75 percent of the meteors seen during the Orionids originated from the nucleus of Halley's Comet, according to Joe Rao, SPACE.com skywatching columnist. While light from the full moon may have washed out much of the view for people in populated areas, some skywatchers did get the chance to see some "shooting stars." Astrophotographer Chris Bakley sent in a photo of an Orionid meteor from North Cape May, NJ. The shot was taken only a couple minutes after moonrise while the moon was still low on the horizon. The larger star in this picture is Venus, and the moon was behind him. Image submitted on Oct. 21, 2013. Skywatcher Chris Bakley managed to take an amazing photo from North Cape May, N.J., during the shower's peak. "The shot was taken only a couple minutes after moonrise while the moon was still low on the horizon," Bakley told SPACE.com via email. "The lager [larger] star in this picture is Venus, the moon was behind me." Bakley's photo shows a skywatcher at the end of a dock. A meteor streaks through the top-right part of the photo with the Milky Way rising out from the central part of the image. The planet Venus is a bright spot shining just above the horizon. The Orionids appear to emanate from the constellation Orion, giving them their name. Many of the meteors seem to come from the constellation's second-brightest star, Betelgeuse. The Orionid meteor shower can be seen well from both the Northern and Southern Hemispheres, a rare cosmic treat. Halley's Comet was last seen from Earth in 1986 and won't appear again until 2061. The comet also produces a second meteor shower called the Eta Aquarids in May when Earth passes through the debris stream again. Editor's note: If you snap an amazing picture of the Orionid meteor shower or any other night sky view that you'd like to share for a possible story or image gallery, send photos, comments and your name and location to managing editor Tariq Malik at spacephotos@space.com.